The Cultural festival day was organized by ACR in partnership with NPA to help youth unlearn violence and promote peace. It was organized under the NPA supported BelednaAwel peace campaign. Cultural performances and speeches revolved around peaceful co-existence. On the scorching sun heat of a Saturday, the youth centre at Bentiu’s Sector Two is filled with children, women and men. They converged to participate in a cultural event in the UN Protection of Civilians’ site. The cultural festival was organized by Action for Conflict Resolution (ACR), a national Organization in partnership with Norwegian Peoples Aid (NPA) for the people to showcase their cultural identities and build peace. The event was organized under the theme “BelednaAwel” local Arabic phrase for our country first. The cultural performances were preceded by musical acts from local artists such as the blind John Kuol who performed his peace songs. Other artists also performed songs preaching peace and unity amongst communities of the former Unity State area who for the last five years sought refuge in displaced persons camp protected by the United Nations Mission in South Sudan (UNMISS). The participants and crowd comprises of people all over the greater Unity State areas. They have lived in the camp enclosed with barbed wire fence for at least five years. People all over the counties of, Panrieng, Leer, Guit, Koch, Abiemnom, Mayiendit, Payinjiar, Mayom and Leer were forced in to the UN PoC at the peak of the South Sudan civil war that started in December 2013. The conflict originally a result of power struggle, then took a tribal line, pitching communities and tribes against each other. It resulted to loss of thousands of lives and displacement of millions from the world’s youngest country. In January, the Office for Coordination of Humanitarian Affairs (OCHA) said the number of people displaced by violence and conflict stood at 4.14 million, of which 1.87 million were internally displaced. At least 105,202 of the internally displaced live in the Bentoiu PoC, making it the largest PoC in the country. In the camp, the youth are enclosed without employment opportunities. Most of them are traumatized and as a result, local conflicts more often escalate in to communal conflicts. The conflicts are caused by early pregnancy of girls, adultery, and clashes over water points and revenge killings, according to James Makuar Latjor, the Peace Project Officer for ACR. He said ACR was formed in 2014 specifically to tackle problems in the PoC, and to promote peace by working to mitigate conflicts among the affected communities in South Sudan, to enhance peaceful co-existence among the communities regardless of age, gender, and ethnicity in Former Unity state in Northern Liech and Southern Liech. ACR works in partnership with Norwegian People’s Aid (NPA) to help youth unlearn violence and promote peace by engaging youth in cultural festivals, sports activities and supporting training youth on conflict resolution skills. Angelina Nyanlok is the leader of a cultural group comprising of members from all counties of former Unity State whose citizens are living in the PoC. She says they formed the group to include people from all counties in order to connect them. “We are here because we want to share our culture with the rest of the people so that the tension in people’s minds will reduce because when people dance and show their cultural background, other people from another cultures will also feel happy and this also reduces the trauma in our minds,” she says. It is Nyanlok’s second participation in the cultural festival. Her first was in 2018 when they showcased diverse cultural practices of sub-clans of the Nuer community. But this time, it is very important for her. “When we participated last year, we got a lot of messages about peace and we felt happy for taking part in the event. Many people joined us in our group and the group grew bigger because of our desire to use the group to preach peace,” she says. “We were impressed and that is why we want to come and show our culture as well as pass out messages of peace to the people,” she added. Nyanlok says they use their cultural groups to create relationships with all the people in the PoC. “In our groups we are all from different counties. We relate well with each other. “When participating in the cultural day, it binds people together. People exchange peace messages, she says. Nyanlok adds that in their group, they visit each other moving from sectors 2, 3, 4, and 5 to share peace messages. “We have also taken a step to meet people in Bentiu town and Rubkona County to share and preach peace among ourselves. We converse and interact together,” she adds. Nyanlok now hopes for the Revitalized Peace Agreement to be fully implemented so that all the people living in displaced person’s camps can return home. “I have hope for this peace agreement will not be like the 2015 agreement. There are some signals of durability in this peace agreement,” she says. One of the positive signs, she says is the “good relationship” between the governors of the opposition and the government governor. “The governors came to the PoC together preaching messages of peace and there is also freedom of movement. You can move from the PoC to Bentiu town and from from Bentiu town to PoC. This shows that the peace agreement is real,” she notes. Nyanlok called on all South Sudanese to unite and embrace peace for the current peace agreement to bring real peace to all South Sudanese. “Let us leave behind all differences because when the war broke us apart. Let us unite because we are a people of one country. Let us unite so that this peace agreement will be a durable one. It is your role as an individual to preach peace to everyone in the country. As citizens, let’s preach peace and let’s not give chance to the leaders to return to war again. Enough is enough,” she emphasizes. Nyanlok leads a group of women from all the eight counties of the former Unity State. They use their connection to preach peace in the PoC and through performing each other’s cultural dances. “We perform cultural dances of all the counties. When we perform, all people regardless of where they come from attend and join us to dance. It creates a special relationship for us and it also enables us forget the bad experiences of the war,” she notes. She now calls for support from NGOs to enable them continue visiting far counties to preach peace through cultural performances. 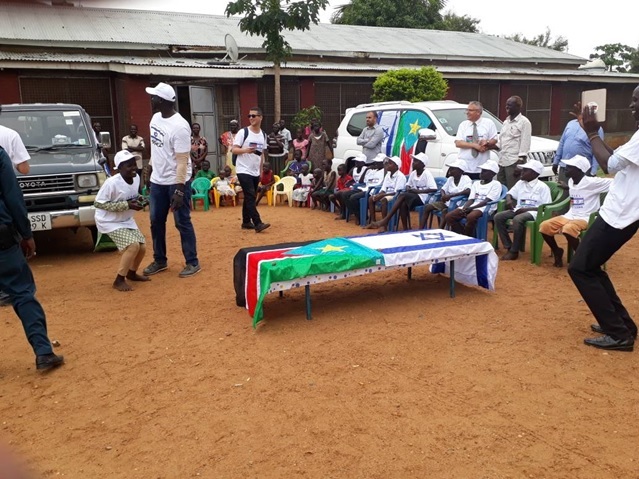 Michael Gorjin, the Project Coordinator for Norwegian Peoples Aid (NPA) told people in Bentiu to embrace peace and put their country first in anything they do. He said the youth should not be engaged in conflicts, but advised them to use their youthful times for peace building. “Youth continue to be at the centre of conflict in South Sudan and can be powerful agents in both creating conflict and peace. With over 72% of the country’s population being under 30 years of age, there is a large number of youth who are tired of violence and conflict and ready for alternatives to transform their lives and communities,” he said. The goal of the project is for conflict-affected youth to unlearn violence and promote peace in South Sudan. “This is largely focusing on changing attitudes of key youth who will then act as mobilizers to promote peace and non-violent conflict resolution approaches to the wider public and to their peers. Thus, when enough attitudes change, there will be a mass attitude change with less fear and hate targeting those seen as the ‘other’ and an increase in peace and tolerance communication that will lead to a shift in social norms,” he explains. “If the attitudes of the youth change in a country where the youth are the majority – then eventually this will lead change at the institutional level,” he adds.